The Channel Islands Bonzer Biscuit become my go-to board real quick, and for a solid 6 weeks, it’s all I rode. From 2ft wobbly ripbowls to 3ft superbank to 4-6ft fairly heaving beaches, the board performed a lot better than I thought it would when I first picked it up. It held in on my nose to the water bottom turns, allowed me to flow masterfully like Machado over dead sections and of course, I rode tubes like Gabby at Backdoor. All in all, this is a great secondary board addition to your quiver. Full rails along with a wider nose shape gives you a forgiving outline that makes your general bogging feel more fluid and on point. A relaxed rocker gives you drive (along with the Bonzer setup) and speed, but you’ll need to be aware of it on steep drops as the nose might catch and you’ll be eating sand. The Channel Islands Bonzer Biscuit is a board you can ride in anything from small dribbly crap to just overhead surf. One of the best things about the Bonzer Biscuit is you can ride it in mostly any conditions up to about 5ft. But you’ll find it really thrives in conditions around the 3ft, forehand point break, type of waves. Early on the type of surf I had the most fun on it was around the 3ft Greenmount type of waves. Waves that gave me time and sections to play around on, wraparounds and cutbacks were on the menu. Once I got a little more used to it, I was able to scoot around in a variety of conditions and found the challenge of riding something unique fun. The flatter rocker on the Bonzer Biscuit definitely helps with acceleration and float when it’s small/chubby, but can also make late drops when it’s steep a bit challenging. Overall I’d suggest chasing down waves up to about 3ft, that are a touch chubby or rolling and you’ll have a ball. The Bonzer Biscuit isn’t a high-performance shortboard board, but it’s also not a board you need to nurse or only ride in certain conditions. 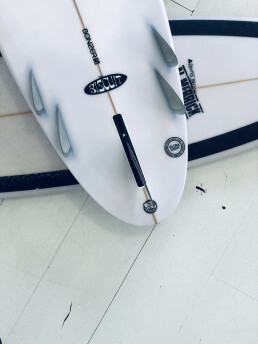 Even though I was riding the 5’6 model, it felt a touch longer which is something you can put down to the fin setup (so I’ve been told), in other words, the Bonzer Biscuit will ride a bit longer then what you think. Apart from the extra float the increased volume brings, and the fact you’ll own a Bonzer, the other big bonus was finding out how you can push through your turns a lot harder than you think. Once you figure out the rail to rail feel, and basic new board feels, you’ll be able to really start opening up on some turns. Generally, with a shorter board, you’ll be drawing shorter turns due to the decreased rail length. Most people tend to snap or squirt through more of their turns, whereas with the Bonzer Biscuit you’ll still be able to draw long lines and push through them. This was a surprisingly nice highlight with the Bonzer Biscuit, along with the speed and overall fun vibes it gave out. I love having this in my quiver, Bonzer’s are such fun to ride and combining it with the biscuit model has given it another level of fun from other Bonzer’s I’ve ridden. It’s a board best ridden from 1-3ft, and while it’s rideable on your backhand you’ll have more fun on your forehand. 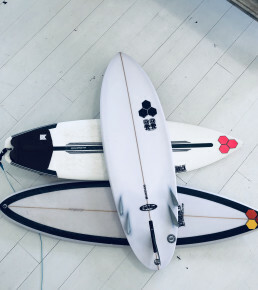 If you have the opportunity to add something new to your quiver beyond the typical performance board or currently hot Twin Fin, then this is a great option. It’ll get you excited to surf, provide a different surfing experience and you’ll always smile that you have a Bonzer in your collection. If the Biscuit option isn’t your thing then there’s the 3D model or Shelter model. The 3D is a step-down model where they stripped out two fins. So you’re left with 3 fins where the 2 side bonzer fins are larger than the regular 5 option. The Shelter is the contemporary shortboard model that goes in all conditions. Three options to choose from if you’re into a CI x Bonzer pick up. The Channel Islands Bonzer Biscuit is widely available globally, anywhere that stocks Channel Islands Surfboards are most likely going to have one of these to run your hands over. Actually, CI have such a wide net of distribution you can probably walk into any surf store and find one, or have a staff member tell you where to get one. Need to know the closest? Hit up their retailer page for more info. Alternatively, you can get all Web 2.0 and buy one online direct from Channel Islands or if you’re in Australia, hit up Onboard. Price wise you’re looking at around $1000 AUD, which ain’t too bad considering this is a board that’s going to be a little different in your quiver and might not get ridden every day. So, odds on, you’ll get a good life out of it, and it’s nice to have something other than a basic shortboard in the collection.